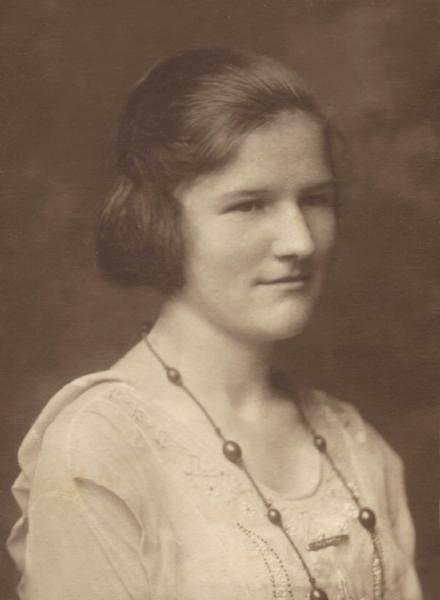 Mary Eula Wood was born on 22 September 1902 in Richards, Grimes County, Texas. She was known as Sister. Campbell Wood and his sister Mary Eula were photographed about 1909. Rush Brevard Wood and Claudia Gertrude Bay appeared in the US federal census of 15 April 1910 in Grimes County, Texas. Other members of the household included Mary Eula Wood, Henry Campbell Wood and Claude Irvin Wood. She married Newton Anderson Jones, son of John Polk Jones and Sarah Louisa Thomas, on 3 April 1922. John Polk Jones and Sarah Louisa Thomas appeared in the US federal census of 1 April 1930 in Montgomery County, Texas, enumerated next to their son John.. Other members of the household included Mary Eula Wood, Edward P. Jones, Newton Anderson Jones and Ivy Knudson Jones. Newton Anderson Jones and Mary Eula Wood appeared in the US federal census of 1 April 1940 in Mill Town, Montgomery County, Texas. Other members of the household included Francis Lew Allen Harris, Ivy Knudson Jones, Edward P. Jones and Robert Efford McCune. No occupation is recorded for Newton Jones or his brother Edward. Robert McCune was Mary Eula's second cousin; their grandfathers were brothers Solomon and Rush Wood. She was employed as a cook at the county jail, according to the 1940 census. Newton Anderson Jones registered for the draft in 1942 in Montgomery County, Texas, while living with his wife Mary Eula in Conroe, and employed by Austin Construction Company (at Dow Chemical Company) in Velasco, Brazoria County. The following appeared on 19 November 1942 in the Harlingen Valley Morning Star: (Edcouch) Mrs. Rush Woods of Richards, Texas, and Mrs. Newton Jones of Conroe, are visiting their aunt and cousin, Mrs. J. M. Cellum. The following appeared on circa 1946 in the Houston Chronicle: A quilt with the map of Texas on it, complete down to the outlines of each of the 254 counties, sounds like quite a chore and it is, according to Mrs. N. A. Jones, 5501 Harrisburg, but she made it. As far as Mrs. Jones knows, no one ever has done one quite like her quilt, and she certainly had a struggle finding a map big enough to trace from. After trying all over town to get a big map (big enough to extend across a double bed), she received some help from a Houston oil company, which helped her locate one. Mrs. Jones’ idea about the map of Texas came because she was tired of chrocheting bedspreads and wanted to do something more out of the ordinary than a regular quilt. And who would blame her for being tired of crocheting? For the little lady had spent three years and eight months crocheting two bedspreads, one for her daughter, Mrs. F. L. Harris, and another for her son and daughter-in-law, Mr. and Mrs. Ivy K. Jones. The first one took her three years because it was during the war, and she couldn’t get all the thread she needed. They were using it to sew parachutes, Mrs. Jones was told. Each of the bedspreads had over 1,000,000 stictches in it, and thread worth $50. “And furthermore,” Mrs. Jones declares, “they’ll always mean something to the children, because they know there’s love in every stitch.”. She officially witnessed the death of Newton Anderson Jones on 14 January 1977 at Deaton Hospital in Galena Park, Harris County, Texas. Mary Eula Wood became a widow at the 14 January 1977 death of her husband Newton Anderson Jones. Mary Eula Wood died on 21 July 1992 at age 89 in Galena Park, Harris County, Texas. She was interred at Forest Park Lawndale Cemetery, Houston, Harris County, Texas. The following appeared in a local newspaper: Mary Eula (Ma) Jones, 89, passed away Tuesday, July 21, 1992, in a local hospital. A resident of Galena Park for 28 years and a member of the Galena Park United Methodist Church. Born in Richards, TX on September 22, 1902, preceded in death by her husband Newton A. Jones. Survived by her daughter and son-in-law, Lurline and Lew Harris of Galena Park; son and daughter-in-law, Ivy K. and Maxine Jones of Houston; sister and brother-in-law, Gertrude and Bill Dostal of Richmond, TX; brother and sister-in-law, Campbell and Genevieve Wood of Houston; sister-in-law, Opal Wood of Navasota, TX; nine grandchildren; 17 great-grandchildren; and a great number of Nephews, Nieces, Cousins, and dear Friends. Funeral services 1:30 p.m., Friday, July 24, 1992, Forest Park Lawndale Cemetery with the Rev. C.H. Stutes officiating. Interment - Forest Park Lawndale Cemetery. Memorials may be made to the Galena Park United Methodist Church.